The stream of heavy-metal pollutants gushing out of Silverton’s mines and into its waterways has grown so toxic that between 2005 and 2010, three out of the four trout species living in the Upper Animas River south of Silverton have disappeared. 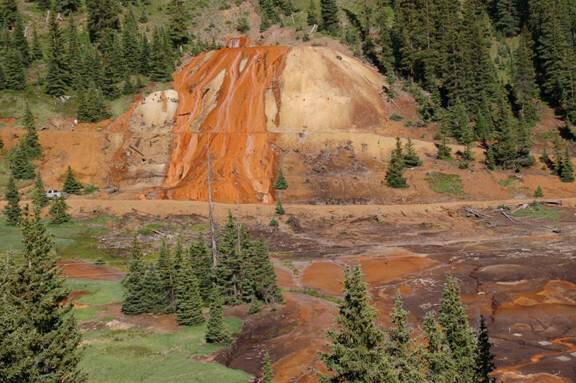 Yet for two decades, vocal Silverton residents have torpedoed the Environmental Protection Agency’s many attempts to designate Silverton’s worst mines as Superfund sites, which would allow the agency to clean up the pollution and make any parties it deems responsible pay for it. Though the environmental catastrophe has, if anything, worsened, Silverton residents long have argued against Superfund, saying federal intervention would sully the town’s reputation, deter mining companies and appall tourists. Even three years ago, it was impossible to imagine, let alone hear, a Silverton resident publicly clamoring for federal intervention in Cement Creek, said Mark Esper, editor of The Silverton Standard. Yet in the last year, he said, there have been signs that locals’ hostility to Superfund is softening. There’s still local animosity toward Superfund. In 2014, at meetings of the Animas River Stakeholders Group (ARSG) and the San Juan County Commission, residents such as Steve Fearn, co-coordinator of the ARSG, warned a Superfund designation would hamper, if not ruin, Silverton’s economy. “As far as I’m concerned, all the opposition is coming from a few people with conflicts of interest, who oppose the EPA because they profit financially from keeping the myth of mining – the idea that mining will come back to Silverton – alive,” Poole said. More water pollution coverage here. The number of brown and rainbow trout in the Animas River swimming through Durango has declined, according to an ongoing study. 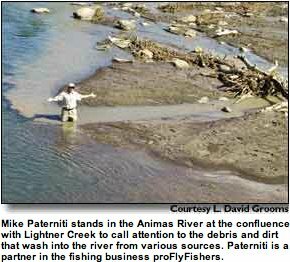 In particular, a decline has been noted in fish from 32nd Street to the Lightner Creek confluence with the Animas, said Jim White an aquatic biologist with Colorado Parks and Wildlife, who worked on the fish survey. The section of the Animas classified as Gold Medal, from Lightner Creek to Rivera Crossing Bridge (behind Home Depot), also saw a decline, but it was not as dramatic. The area maintained its classification as a prime fishing destination, but the researchers found a decline in large fish. This is the first time the area hasn’t met the Gold Medal standard for large fish since 1996, White said. Colorado Parks and Wildlife stocks the Animas with both kinds of trout, and the stocking practices have not changed in about 20 years. However, the most recent survey in September revealed a worrisome decline in both young and large brown trout compared with prior years, White said. “We’re concerned over the absence of these young brown trout,” he said. White plans to start monitoring brown trout specifically and tracking their population fluctuation. He completes fish surveys along this stretch of the Animas every two years. Zinc and cadmium from the mines near Silverton have had an adverse effect on the fish and the environment upstream of Bakers Bridge, said Peter Butler, coordinator of the Animas River Stakeholders Group. Some other negative factors could include warmer water in the summer, sediment levels, low water levels and other possible factors. An insect-population study done this fall may reveal more information about river health next year. The Ecosphere Environmental Services study focused on the food supply for fish, and it will be compared to a similar study completed 10 years ago. The results will be released in the spring, Skillen said. Anecdotally anglers have noticed a decline in caddisflies, pale morning duns, midges and blue-winged olives, he said. Some of these insect populations may be affected by sediment flowing into the river because it fills in areas where they live, White said. 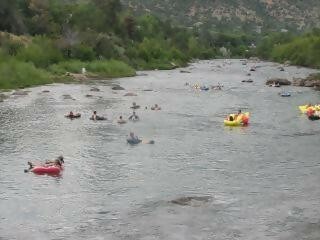 More Animas River coverage here. Efforts to clean up the Boston Mine site, which at one time leaked 20 gallons a minute of toxic iron, copper, manganese and zinc into Lightner Creek, aren’t new. In 1992, grants from the Office of Surface Mining and the Bureau of Mines funded construction of wetland retention ponds to treat seepage and to assess the effectiveness of certain work. “We stopped the leaks with the wetlands and by closing a collapsed spot that was allowing water to fill the mine workings and create seepage elsewhere,” Brown said. No seepage is seen today, she said. The restoration will include closing a shaft, contouring a hillside, redirecting a ditch to carry runoff to one of the old retention ponds and seeding, mulching and applying 8 inches of compost and biochar – woody material reduced to charcoal through anaerobic processing – that retains a lot of water. Why is this sort of turbidity – what I choose to call the Lightner Creek problem – happening at this time of year? One possible cause of the current problem is a substantial rain event back on Sept. 13 that dumped upwards of an inch of water on Durango and the Perin’s Peak area. The Perin’s Peak geology is predominately Mancos shale, which is easily eroded. This area drains into Lightner Creek predominantly through Perin’s Canyon, where there is a 4-foot-diameter culvert delivering the canyon’s flow into Lightner Creek. The storm on Sept. 13 delivered a huge volume of sediment to the creek, damaging the culvert and depositing a substantial amount of sediment in the creek bed. Since that time, and especially after the more recent storms, we are seeing the slightest amount of current in Lightner Creek pick up the fine sediment and transport it to the Animas River. Why should we care? The Animas River is the city of Durango’s crown jewel. It’s a playground for all of us, visitors and locals, both in the water and walking along the River Trail, and a source of revenue from recreation. A good portion of our drinking water comes from the intake structure downstream of Lightner Creek and just above Smelter Rapids, although I am told this is not a big concern for the water treatment plant. More Animas River watershed coverage here. More Animas River watershed coverage here and here.